This post has been a long time coming, in fact, I visualised this post approximately one year ago. Unfortunately, I never found the chance to ever make it, and at the time, I was only feeding my mouth, rather than my boyfriend's too. So, now that I cook for two, it seems ever so slightly more acceptable to make desserts as I am safe knowing it won't be me who eats the entirety of it. If you've been reading SSL for a little while, you'll be well aware that salted caramel is one of my weaknesses when it comes to indulgences. So, how about we combine salted caramel with one of the greatest, classic desserts of all time, apple crumble? Sound like a good idea? Well, I can confirm, and my boyfriend, James, can confirm that indeed, it's a flipping fantastic idea. 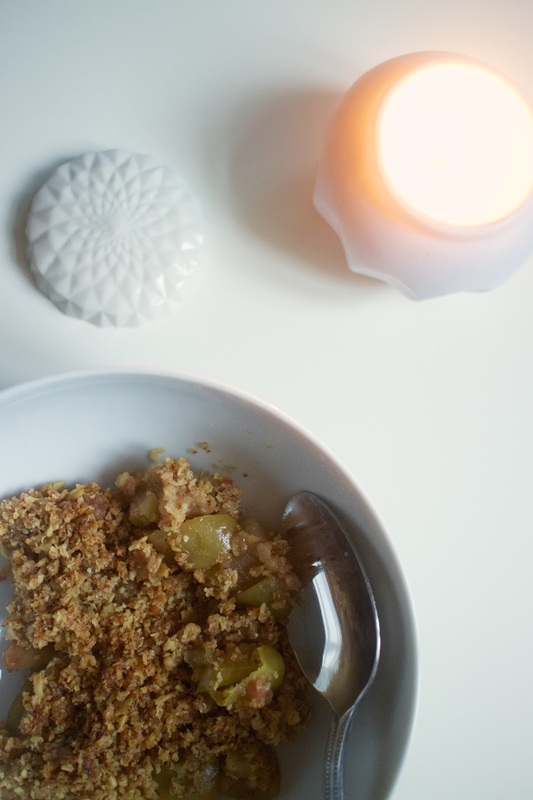 This is a combination of two crumble recipes - one being a super indulgent, classic apple crumble and the other being a healthier but still incredibly delicious crumble. This is an incredibly indulgent dessert that will leave your tastebuds and tummy satisfied, and the 'lower carb' topping won't lead to bloating. Feel free to make things gluten free by using gluten free oats, or dairy free/vegan friendly by swapping butter for coconut oil - this may not make the same results as this recipe suggests, but feel free to experiment. Inspired by Stevie Perle's Salted Caramel Apple Crumble recipe and Madeleine Shaw's Cherry Crumble With Cashew Cream recipe from Get The Glow. 1. Pre-heat the oven to 180 degrees celsius. Core and chop up your apples into inch sized chunks. Squeeze the juice of the lemon over and leave in a bowl to one side. 2. In a medium sized saucepan, gently melt the butter and sugar together on a low to medium heat. Once it has completely melted, sprinkle over your salt and combine. 3. Add your apples to the pan and coat them with the caramel. Continue to stir the apples every 30 seconds-one minute. The caramel will appear to increase in volume as the apples soften and the juices are released. Take off the heat once the apples have softened, yet still hold their shape. This should take approximately 10 minutes. 4. Using a blender, food processor or NutriBullet (like I did), blitz the almonds until they are almost entirely a flour like consistency. Don't worry if some of the almonds are whole/chunky - this adds a lovely texture. Set aside in a large mixing bowl. Use the milling blade if you're using a NutriBullet. 5. In the same device, blitz your oats until they form a flour. Add to the bowl, alongside your cinnamon, ginger and a pinch of salt. Mix the dry ingredients together. 6. In a small, microwave safe bowl or in a small saucepan, melt the remaining butter or coconut oil and pour over your dry ingredients. Mix together until the dry ingredients are completely incorporated with your melted butter/coconut oil. 7. In a large dish, pour your salted caramel coated apples into the dish and make sure you get every last drop of that salted caramel! Then, spread your crumble topping on top of the apples, until there are no gaps left. Pop into the oven for 30 minutes, until the top is golden brown. 8. Serve with a dribble of double cream, or a scoop of vanilla ice cream. I had mine with some Sainsbury's Taste The Difference Salted Caramel Double Cream which was an incredibly rich, luxurious, indulgent addition! Let me know if you make this salted caramel apple crumble - I'd love to see your versions on Twitter or Instagram! Do you have a favourite, warming, Autumn/Winter dessert? Are you a fan of salted caramel?